Effortless weight loss by drinking slimming tea either alone or in combination with your regular diet several times a day seems too good to be true -- and that's because it is. Most slimming diet teas contain some combination of stimulants, bulk fibers and laxatives to rev you up, fill you up and empty you out. Unfortunately, all of these ingredients come with side effects that can be exacerbated if you drink slimming tea on an empty stomach. Natural stimulants such as caffeine, guarana and ma huang are widely touted for their ability to increase your metabolism, but no scientific studies have proven this effect. Certain individuals experience a racing heartbeat or short-term feeling of increased energy after ingesting these natural stimulants. These effects may be enhanced by drinking slimming tea on an empty stomach, but the effects are not strong or long-lasting enough to cause increased weight loss. Bulk fibers like agar, psyllium and methylcellulose supposedly generate a feeling of fullness. However, they don't stay in your stomach. Bulk fibers swell when they come in contact with liquids, and work as a laxative. If used consistently over a long period of time, bulk fibers can interfere with your body's natural elimination system, causing chronic constipation, which is often accompanied by abdominal bloating. These bulk fibers work the same way whether your stomach is empty or not, so there is no advantage to starving yourself. Laxatives stimulate your bowels, forcing rapid eliminations. Contrary to popular belief, moving food quickly through your system does not cut down on the number of calories that you absorb and process. The overuse of laxatives can lead to dehydration, which can be dangerous and even life-threatening. Taking the laxatives in slimming tea on an empty stomach can lead to severe stomach cramps. 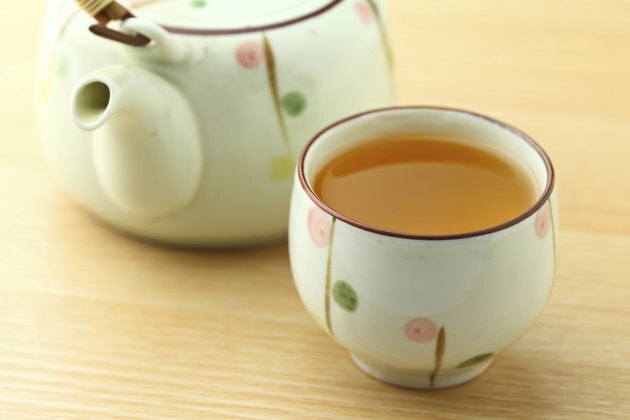 The side effects of drinking slimming tea on an empty stomach -- or even on a full one -- include dizziness, nausea, vomiting, severe stomach cramps and diarrhea. The long-term use of slimming teas can lead to chronic constipation, dehydration, fainting, irregular heartbeat and even death, especially among those with eating disorders whose health is already compromised. An occasional cup of slimming tea when things aren't moving as smoothly as you'd like probably won't hurt you, but daily use of a slimming tea instead of eating a proper diet won't help you lose weight and may cause you harm. Go Ask Alice! ; Herbal Diet Teas for Weightloss — Herbalicious?